Our product range includes a wide range of temperature sensor transducer for hospital. We are the leading manufacturer and supplier of a wide range of Temperature Sensor Transducer For Hospital. These are designed as per international industrial standards and widely admired for their purpose specific construction, high efficiency and consistent performance. we employ top quality components to manufacture these devices which further ensure its high durability and robustness. Hvac system building management system. Climatic test chambers paper industries. 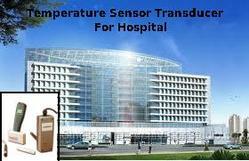 Looking for Temperature Sensor Transducer for Hospital ?